lies, 850 genera, and 2,465 species of vascular plants can be found. Located at the juncture of several physiographic provinces, it is an ecological crossroad. Plants representative of several phytogeographic regions are present, with species characteristic of the eastern deciduous forests and grasslands being most common. The diversity of plant vegetation types present—14 are traditionally recognized (Duck and Fletcher map on the cover)—reflects this diversity of species. This tremendous diversity of plant spe­cies and communities in Oklahoma reflects the considerable variation in the state’s climatic, physiographic, geological, and edaphic features. A plethora of different habitats for plants is present. Brief descriptions of this variation are presented in the following paragraphs. 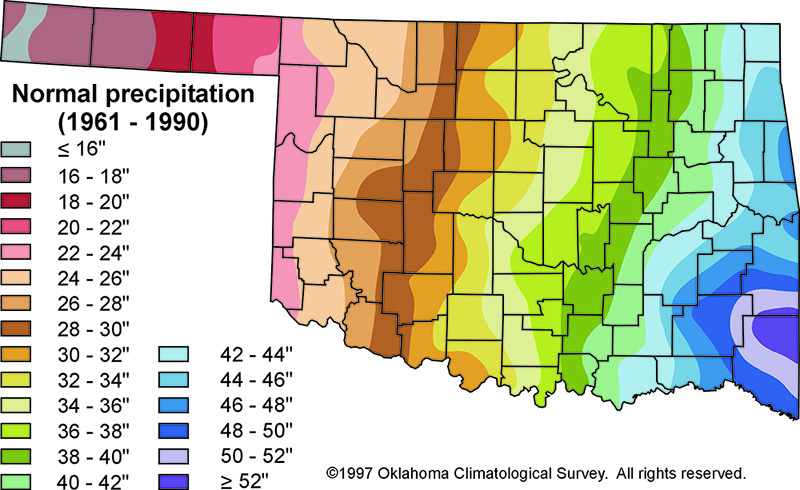 Oklahoma’s continental climate is character­ized by geographical and seasonal variability in both precipitation and temperature (Oklahoma Climatological Survey, 1990). The eastern part of the state is more strongly influenced by moisture from the Gulf of Mexico than the drier western portion of the state. Average yearly precipitation varies from more than 56 inches (1,400 mm) in the southeast to less than 16 inches (400 mm) in the extreme northwest—a gradient of about 1 inch (25 mm) of rainfall for every 15 miles (25 km) traveled from east to west (Figure 1a). Likewise, the Precipitation Effectiveness In­dex—the ratio of precipitation to evaporation in 24 hours and an index of the growing conditions faced by plants—exhibits a gradient across the state; more than 65% in the east to less than 25% in the west (Figure 1b). 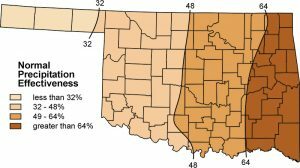 The distribution of Oklahoma’s vegetation types generally reflects these two gradients, with deciduous forests in the eastern third of the state giving way to tallgrass and mixedgrass prairie in the middle and shortgrass prairie in the west. Temperature in Oklahoma also exhibits sea­sonal and geographical variation, although not as strikingly as precipitation. In the eastern part of the state, temperature averages are lower in the summer and higher in the winter. The frost-free season averages 225 days in the south to less than 170 days in the north (Figure 1c). As is characteris­tic of a continental climate and familiar to all who live in the state, daily temperature fluctuations can be abrupt and dramatic. As might be expected, species richness—the number of different species present in an area—is greatest in the southeast corner of the state, which has the mildest winter temperatures and the longest growing season. Figure 1a. Climatic features of Oklahoma. 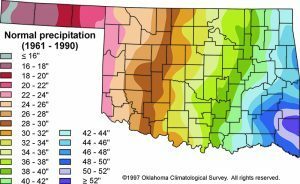 (a) average annual precipitation (inches; Oklahoma Climatological Survey, 1997). Figure 1b. normal precipitation effectiveness (%; adapted from Curry, 1970). Figure 1c. 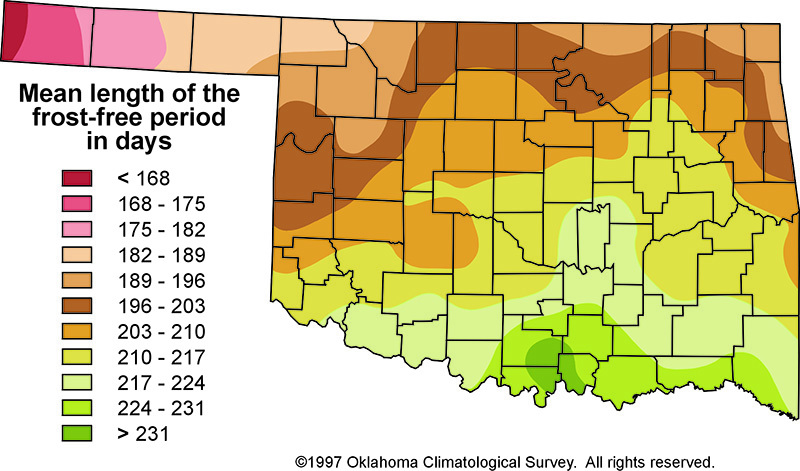 length of growing season (days; Oklahoma Climatological Survey, 1997). In addition to being botanically diverse, Okla­homa also is physiographically and geologically varied and complex (Johnson et al., 1979). Strata from every geological time period can be found exposed at one point or another within the state’s boundaries (Figure 2). Approximately 99% of the formations are sedimentary; e.g., the familiar Permian sandstones in the west, the Mississippian limestones in the northeast, and the Ordovician to Pennsylvanian sandstones and shales in the southeast. The remaining 1% is igneous (Wichita Mountains) or slightly metamorphic (parts of the Ouachita Mountains). One of the common misconceptions about Oklahoma is that it is monotonously flat, with little topographic variation in its landscape. In reality, this is not the case. Only a few areas of the state are truly flat. Rolling hills and broad plains dissected by broad river valleys are more characteristic. The Ozark Plateau and three mountain provinces—Ouachita, Arbuckle, and Wichita—provide conspicuous relief. In addition, escarpments, cuestas, buttes, mesas, narrow canyons, and deep ravines are present. Twenty-six geomorphic provinces—large regions of similar landforms resulting from ero­sion and/or deposition of sediments—have been described in Oklahoma (Figure 3). The varied topographic features of these provinces provide a diversity of habitats for plants. 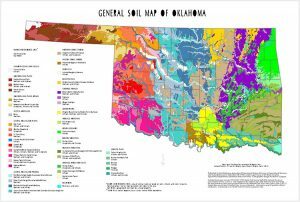 As might be expected because of Oklahoma’s geological and physiographical diversity, its soils also are quite diverse (Figure 4). In general, ul­tisols dominate in the eastern third of the state; alfisols and mollisols in the center, and inceptisols in the western third. Covering more area of the state than any of the other soil types, the dark, rich mollisols also are characteristic of the state’s northeastern prairie and central Panhandle areas. Also present are vertisols and entisols. A mosaic of clay, loam, and sandy soils occurs across the state’s landscape. The physical prop­erties of these soils; for example depth, water, nutri­ent holding capacity, aeration, and resistance to erosion, markedly influence the plants growing in them, and often distinctive, easily observed assemblages of species will characterize them. Illustrative of this relationship is the sandsage-grassland community associated with the sandy soils of western Oklahoma. Figure 2. Generalized geologic map of Oklahoma (adapted from Branson and Johnson, 1972). Figure 3. Geomorphic provinces of Oklahoma (adapted from Curtis and Ham, 1972). Figure 4. General Soil Map of Oklahoma (Carter, 1996). Oklahoma has 173 families, 850 genera, and 2,465 species of vascular plants. Within its borders, Oklaho­ma has plants characteristic of the forests of New England, the swamps of the Gulf Coast states, the deserts of the Southwest, the mountains of the West, and the prairies of Canada. Fourteen vegetation types are traditionally recognized and they reflect this diversity. These vegetation types and their alteration by human activity are described in the following paragraphs. Descriptions of the flora and vegetation of Oklahoma begin with the observations of early visitors such as Vasquez de Coronado, Juan de Onate, Thomas Nuttall, Edwin James with the Long expedition, Washington Irving, Charles Lathrobe, Josiah Gregg, S.W. Woodhouse with the Sitgreaves and Woodruff expedition, G.G. Shumard with the Marcy expedition, and J.M. Bigelow with the Whipple expedition (Bruner, 1931; Featherly, 1943). In their journals and expedition reports are glimpses of the state’s vegetation prior to the arrival of eastern tribes of Native Americans and Europeans. geology, soils, climate, and land use in relation to game animal populations. In the decades since the publication of Duck and Fletcher’s map, vegetation studies in the state focused only on distinctive, local ecological areas or tracts of particular economic or conservation interest. A modern classification of the state’s vegetation was not attempted until the late 1990s when Hoagland (2000) published a scheme based on guidelines developed by the Vegetation Subcommittee for Classification and Information Standards (FGDC, 1997). He rec­ognized 121 alliances in 151 associations. This detailed classification, incorporating all previous systems, provides scientists with a basis for land­scape mapping and conservation planning. In this publication, we continue to use the Duck and Fletcher system because it is easy to use by indi­viduals with diverse backgrounds. Brief descrip­tions of the 14 categories recognized by them are presented in the following paragraphs. It must be noted that although Duck and Fletcher mapped the distribution of pinion pine, Pinus edulis (light blue on map), they did not describe it as a distinct type in their 1945 treatise, but rather included it in their Pinon-Juniper Mesa type. In Oklahoma, this type represents the western edge of the eastern deciduous forest, with species characteristic of the Ozark Plateau and espe­cially the northeast quarter of the continent. Its distribution coincides primarily with the limits of the Ozark Plateau Physiographic Province. Taxa typically encountered include: black oak, Quercus velutina; white oak, Q. alba; northern red oak, Q. rubra; post oak, Q. stellata; mockernut hickory, Carya tomentosa; and bitternut hickory, C. cordiformis. Pockets of shortleaf pine, P. echinata, also are present. Numerous other tree, shrub, and herbaceous species characteristic of the decidu­ous forest likewise occur. This type is similar to the Oak-Hickory for­est, but includes short leaf pine, P. echinata, in abundance and other species characteristic of the southeast quarter of the continent. Some ecologists do not recognize it as a distinct type. Its distribution coincides with the limits of the Ouachita Mountain Province. In addition to the species characterizing the Oak-Hickory Forest, also encountered are blackjack oak, Q. marilandica; winged elm, Ulmus alata; water oak, Q. nigra; willow oak, Q. phellos; and blackgum, Nyssa sylvatica. As its name implies, this type is dominated by post oak, Q. stellata, and blackjack oak, Q. marilandica, the two most abundant tree species in Oklahoma. Distributed in a north-south swath across the state, it typi­cally forms a mosaic with the Tallgrass Prairie, the two types being collectively referred to as the “Cross Timbers.” Associated species include black hickory, C. texana; Shumard’s oak, Q. shumardii; chittamwood, Bumelia lanuginosa; sugarberry, Celtis lae­vigata; and northern hackberry, C. occidentalis. In several areas along its eastern edge, it is contiguous with the oak-hickory and oak-pine forests. Also a portion of the eastern deciduous for­ests, this type is dominated by lob­lolly pine, P. taeda, and other species characteristic of the southeast quarter of the continent; e.g., southern red oak, Q. falcata, and sweetgum, Liquidambar styraciflua. Its distribution corresponds to the level, sandy soils of the Dissected Coastal Plain Geomorphic Province. Present only in the drainages of the Little and Mountain Fork rivers, this type is dominated by bald cypress, Taxodium distichum; sweetgum, L. styraciflua; blackgum, N. sylvatica; water oak, Q. nigra; willow oak, Q. phellos; and other woody and herbaceous species characteristic of the southeast quarter of the continent. Associated with gravel and sand bars, and the lowest terrace of all river and creek systems, this type occurs across the state and is quite variable with respect to the species present. In the west, cottonwood, Populus deltoides; species of willow, Salix; and the introduced salt cedar, Tamarix chinensis, are encountered. In the east, sycamore, Platanus oc­cidentalis; green ash, Fraxinus pennsylvanica; white ash, F. americana; American elm, U. americana; and species of hackberry, Celtis spp., also occur. Herbs, vines, and shrubs are typically abundant in the understory. Covering the greatest area of Oklahoma, this type dominates the center of Oklahoma from north to south. In some areas, the Post Oak-Blackjack Oak Type bisects the Tallgrass Prairie and typically forms the mosaic collectively referred to as the “Cross Timbers.” Often reaching heights of 3.28 to 9.84 feet (1 to 3 m), big bluestem, An­dropogon gerardii; little bluestem, Schizachyrium scoparium; Indiangrass, Sorghastrum nutans; and switchgrass, Panicum virgatum, dominate. Numerous other perennial grasses and forbs are present. Occurring in the counties of the Panhandle and the extreme northwest corner of the body of the state, this type is dominated by shortgrasses such as buffalograss, Buchloe dactyloides, and blue grama, Bouteloua gracilis. In moister sites, sideoats grama, Bouteloua curtipendula, and little bluestem, S. scoparium, are present. Characterized by low, ir­regular precipitation, these grasslands are nearly devoid of trees. Distributed across the western quarter of the body of the state, this type comprises a mixture of tall- and shortgrasses. The more mesic eastern tallgrasses occur where conditions are moist, whereas the western shortgrasses occur in the drier habitats. Trees and shrubs, such as eastern redcedar, Juniperus vir­giniana, and hackberry, Celtis spp., occur in deeply eroded ravines and canyons. This type is defined to encompass all sandy grasslands in which sandsage, Artemisia filifolia, is an important part of the cover. Distributed primarily throughout the northwest corner of the state, including the Panhandle, it occurs mainly on the north sides of the principal rivers and creeks. Species characteristic of sandy soils domi­nate and include sand bluestem, A. gerardii ssp. hallii; sand plum, Prunus angustifolia; lemon sumac, Rhus aromatica; sand lovegrass, Eragrostis trichodes; and plains yucca, Yucca glauca. Occurring in the southwest corner of the state, this type comprises shortgrass species such as buffalograss, B. dactyloides; blue grama, B. gracilis; and sideoats grama, B. curtipendula, associated with scattered trees of mesquite, Prosopis glandulosa. The soils for the most part are clays, with gypsum often present. Redberry juniper, J. pinchotii; plains yucca, Y. glauca; and plains pricklypear, Opuntia macrorhiza, also are present. Distributed in sandy soils of the western most counties of the body of the state, this type is the eastern edge of a vegetation type that occurs in the Texas Panhandle and eastern New Mexico. The dominant shrub is shinnery oak, Q. havardii, which forms extensive thickets of plants 1.64 to 3.28 feet (0.5 to 1 m) tall interspersed with islands of taller trees called mottes. Associated species are those character­istic of sandy soils and the Sandsage Grassland type. This type occurs on the north sides of the Ci­marron and North Canadian rivers in northwest Oklahoma. As its name implies, stabilized sand dunes are its predominant topographic feature. Sand-loving species playing important roles in stabilization and succession include: giant sandreed, Calamovilfa gigantea; sand bluestem, A. gerardii ssp. hallii; lemon sumac, R. aromatica; sand plum, P. angustifolia; soapberry, Sapindus drummondii; and chittam­wood, B. lanuginosa. In extreme northwest Cimarron County, Black Mesa and the surrounding area support isolated stands of species characteristic of the western half of the continent, including pinon pine, P. edulis; one-seeded juniper, J. monosperma; and ponderosa pine, P. ponderosa. Associated with these woody species are shortgrass and herbaceous species typical of the xeric conditions present. As one traverses Oklahoma, it quickly be­comes obvious that the distribution of the state’s vegetation types is correlated with climatic and edaphic gradients, and their geographi­cal distribution is somewhat predictable. This general relationship is summarized in Figure 5. Historically, overlaying this interaction of soil, precipitation, and vegetation were frequent wildfires, herbivory, and droughts. However, the distributions of some woody species, most notably eastern red cedar, J. virginiana, and mesquite, P. glandulosa, do not exhibit this relationship. Figure 5. Distribution of vegetation types in relation to climate and soils, excluding bottomland forest. Although we have summarized the putative “natural” vegetation types of Oklahoma as de­scribed by Duck and Fletcher, it must be stressed that these types have been altered significantly by human activity. The arrival of prehistoric Native Americans, the relocation of Native American tribes from elsewhere in the country beginning in the 1830s, and the subsequent influx of Euro­pean settlers in vast numbers in the late 1800s impacted Oklahoma’s vegetation. Today, almost all vegetation types have been altered to vary­ing degrees. Factors contributing to this change include suppression of wildfires, plowing of the land, poor management of grazing by domes­ticated animals, introduction of invasive exotic plant species, and urbanization. Illustrative of this alteration in the landscape of Oklahoma is the change in the oak-hickory and oak-pine forests of the eastern third of the state. The arrival of aboriginal peoples in Okla­homa coincided with glacial retreat in North America. At that time the eastern portion of the state was dominated by boreal forest as indicated by analyses of pollen cores (Delcourt and Del­court, 1987 and 1991). As this boreal forest retreated northward, prehistoric peoples used fire as a tool to manipulate the forest (Buckner, 1989; Foti and Glenn, 1991). Plant communities developed under the influence of frequent fire coupled with the ongoing changes in climatic conditions asso­ciated with the glacial retreat. When Hernando de Soto journeyed into the Ozark region of Arkansas and Missouri in the 1500s, his chronicler described a land dominated by prairies with trees restricted to the drainages (Beilmann and Brenner, 1951). In the 1700s and 1800s, explorers visiting the Ouachita Mountains described the landscape as comprising forests or scattered trees interspersed with prairies (Lewis, 1924; Nuttall, 1980). Today, closed-canopy forests cover both regions. In contrast to the savannah or open woodland structure of the past, these forests have overlapping crowns that prevent the growth of shade-intolerant herbaceous and woody plants in the understory. Suppression of fire is the reason for this change. Historically, frequent anthropo­genic- and (to a lesser extent) lightning-caused fires maintained the open nature of the vegeta­tion (Masters et al., 1995). Although with an average frequency of three to four years, these fires more likely occurred at one- or two-year intervals for periods of time, and then did not occur for five to twelve years. Such a fire regime reflects the occurrence of the early Native American tribes in the areas and weather patterns (Foti and Glenn, 1991; Masters et al., 1995). Subsequent decline in fire frequency has been correlated with a decline in the population of Native Americans inhabiting the area, possibly due to the introduction of dis­ease by Europeans and conflicts among different tribes (Gibson, 1965; Wyckoff and Fisher, 1985). Following relocation of the Choctaw Nation in southeastern Oklahoma, fire frequency again increased. The region’s fire regime was further altered as Europeans began to settle and actively suppress wildfires (Masters et al., 1995). Likewise, changes in the appearance of the post oak-blackjack oak forests of the Oklahoma Cross Timbers are due to the suppression of fire coupled with poor grazing management (Fran­caviglia, 2000). The original character of the Cross Timbers was probably a mosaic of grasslands, savanna-like grasslands, oak mottes, oak thickets, and dense oak woods. Grimm (1984) called this spatial variation a “fire probabil­ity pattern.” It resulted from hot, frequent fires sweeping a landscape that contained both fire-prone topographic sites and natural barriers to fire. Exclusion of fire allowed the development of closed tree canopies, reduced the likelihood of fuel accumulations necessary to support intense burns, and permitted invasion of woody species such as eastern redcedar into the grasslands, shrublands, and forests. Ranching practices, in particular poor graz­ing management and fire suppression, also have had a profound impact on the vegetation of Oklahoma. Histori­cally, large herbivores such as bison, elk, mule deer, white-tailed deer, pronghorn antelope, and small grazing/browsing mammals were attracted to areas that had been recently burned and formed a mosiac with unburned sites (Truett et al., 2001). These animals rotationally grazed prairies, shrublands, and forests based on the scale and timing of fires (Engle and Bidwell, 2001). They congregated on the burned sites for the entire growing season or until the forage was gone. They then moved to another burn site, usually the most recently burned. Thus, the historical landscape structure, landscape pattern, and composition of the plant communities present were directly affected by the fire-grazing interaction or what we now call patch-burn/patch-graze (Steuter, 1986; Fuhlendorf and Engle, 2001). The arrival in the 1800s of relocated Native American tribes and European settlers drastically altered these ecological interactions. Fencing, for example, prevented natural animal movement and allowed areas to be stocked with more cattle than the land could support. Repeated grazing of the grasses and forbs that constitute the fine fuels supporting fire reduced them to levels at which fire was no longer a driving ecological force on the landscape. As a result, woody plants began to increase, the grasses and forbs declined further, and the native plant communities present began to degrade. Today, improper grazing by livestock is still a significant problem throughout the state. Two terms commonly used to denote improper grazing are overuse and overgrazing. Overuse by livestock means that the plants are too short (leaf area needed for photosynthesis too reduced) to maintain their vigor and thus persist at the site. As the preferred grazing plants decline or die, other plants, usually those less palatable to the grazing animals, replace them. A measurable change in the composition of the vegetation at the site as the result of overuse is defined as overgraz­ing. 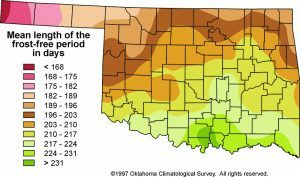 This change is easily reversed by a change in management in a relatively short period of time in the wetter central and eastern parts of Oklahoma. In contrast, in the drier western part, measurable changes may take several years or decades to occur. Fortunately, Oklahoma’s native plant communi­ties are very resilient and can only be destroyed by plowing or urbanization. Thus, restoration efforts can be accomplished on many sites where native plant communities still exist. Patterns of grazing — varying from continu­ous year-round stocking to multiple-paddock rotations with cross-fencing and many moves during the graz­ing season — also have a profound impact on Oklahoma’s vegetation types, especially the biological diversity of each. Differ­ent grazing systems produce different landscape patterns, different plant community composition, and different habitat structure. For example, uneven grazing patterns under season-long and year-long continuous grazing create a condition of shortgrasses and bare ground interspersed among lightly grazed bunches of tall grasses. Research studies indicate that continuous grazing at light to moderate stocking rates provides the best indi­vidual animal performance and a moderate level of habitat diversity in Oklahoma. Importantly, it also provides the desired habitat structure and composition needed for wildlife species such as Northern Bobwhite Quail, Greater-prairie Chicken, and Lesser-prairie Chicken. Rotational grazing with cross-fencing has been advocated to enhance animal performance, pre­vent spot grazing, and improve grazing distribu­tion. This approach is based on mostly unsupported claims and folk lore. For example, proponents have suggested that moving cattle controlled by fencing from grazed to ungrazed areas mimics the historical grazing patterns of the native, large herbivores such as bison and elk. This proposition is erroneous and has no basis in science or historical evidence. As noted above, historical observations and contemporary research clearly demonstrate that grazing and browsing animals are attracted to plants with the highest forage quality that occur in the most recently burned area. Animals will spend most of their time on the burned area until higher quality forage is available elsewhere. A significant drawback to rotational grazing with cross-fencing is that it reduces the structural and compositional diversity of an ecological site, and thus re­duces habitat quality for many wildlife species. An approach that mimics historical fire and grazing patterns is the patch-burn/patch-graze system (Fuhlendorf and Engle, 2001). Beilmann, A.P. and L.G. Brenner. 1951. The recent intrusion of forests in the Ozarks. Annals of the Missouri Botanical Garden 38:261-282. Blair, W.F. and T.H. Hubbell. 1938. The biotic districts of Oklahoma. American Midland Naturalist 20:425-454. Branson, C.C. and K.S. Johnson. 1972. Generalized geologic map of Oklahoma. p. 4. IN: Johnson, K.S., C.C. Branson, N.E. Curtis Jr., W.E. Ham, W.E. Har­rison, M.V. Marcher, and J.F. Roberts. 1979. Geology and Earth Resources of Oklahoma. An Atlas of Maps and Cross Sections. Oklahoma Geological Survey Educa­tion Publication Number 1. Norman, Oklahoma. Bruner, W.E. 1931. The vegetation of Oklahoma. Eco­logical Monographs 1:99-188. Buckner, E. 1989. Evolution of forest types in the Southeast. pp 27-34. In T.A. Waldrop, editor. Pro­ceedings of Pine-hardwood Mixtures: A Symosium on Management and Ecology of the Type. General Techni­cal Report SE-58. U.S. Department of Agriculture, Forest Service. Southern Forest Experiment Sta­tion, Asheville, North Carolina. Carter, B.J. 1996. 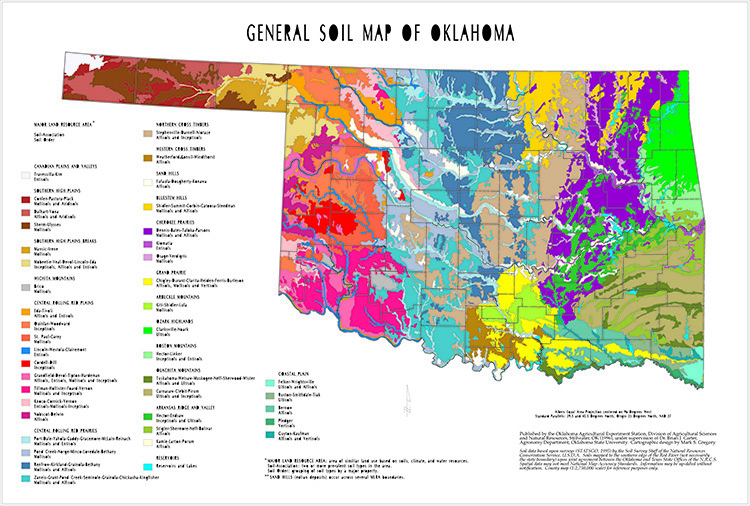 General Soil Map of Oklahoma. Okla­homa Agricultural Experiment Station, Division of Agricultural Sciences and Natural Resources, Oklahoma State University, Stillwater, Okla­homa. Currey, B.R. 1970. Climate of Oklahoma. U.S. Depart­ment of Commerce. Climatology of the United States Series. Number 60-34. Washington, D.C.
Curtis, N.E. Jr. and W.E. Ham. 1972. Geomorphic provinces of Oklahoma. p. 3. IN: Johnson, K.S., C.C. Branson, N.E. Curtis Jr., W.E. Ham, W.E. Harrison, M.V. Marcher, and J.F. Roberts. 1979. Geology and Earth Resources of Oklahoma. An Atlas of Maps and Cross Sections. Oklahoma Geological Survey Education Publication Number 1. Norman, Oklahoma. Delcourt, H.R. and P.A. Delcourt. 1991. Late-quater­nary vegetation history of the interior highlands of Missouri, Arkansas, and Oklahoma. pp 15-30. In D. Henderson and L.D. Hedrick, editors. Restoration of Old-growth Forests in the Interior Highlands of Ar­kansas and Oklahoma. Proceedings of a Conference, Winrock International, Morrilton, Arkansas. Delcourt, P.A. and H.R. Delcourt. 1987. Long-term forest dynamics of the temperate zone. Ecological Studies 63. Springer-Verlag Inc., New York. Duck, L.G. and J.B. Fletcher. 1943. A Game Type Map of Oklahoma. A Survey of the Game and Fur-bearing Animals of Oklahoma. Oklahoma Department of Wildlife Conservation, Oklahoma City. Duck, L.G. and J.B. Fletcher. 1945. The game types of Oklahoma: introduction. IN: A Survey of the Game and Fur-bearing Animals of Oklahoma. State Bulletin No. 3. Oklahoma Department of Wildlife Conservation, Oklahoma City. Engle, D.M. and T.G. Bidwell. 2001. Viewpoint: the response of central North American prairies to sea­sonal fire. Journal of Range Management 54:2-10. Featherly, H.I. 1943. The cavalcade of botanists in Oklahoma. Proceedings of the Oklahoma Academy of Science 23:9-13. Federal Geographic Data Committee (FDGC). 1997. Vegetation Information and Classification Standard. Vegetation Subcommittee for Classification and Information Standards. United States Geological Survey, Reston, Virginia. Foti, T.L. and S.M. Glenn. 1991. The Ouachita Moun­tain landscape at the time of settlement. pp 49-65. In D. Henderson and L.D. Hedrick, editors. Restoration of Old Growth forests in the Interior Highlands of Arkansas and Oklahoma. Proceedings of a Conference, Winrock International, Morrilton, Arkansas. Francaviglia, R.V. 2000. The Cast Iron Forest. University of Texas Press, Austin, Texas. Fuhlendorf, S.D. and D.M. Engle. 2001. Restoring het­erogeneity on rangelands: ecosystem management based on evolutionary grazing patterns. Bioscience 51:625-632. Gibson, A.M. 1965. Oklahoma: A History of Five Centu­ries. Harlow Publishing, Norman, Oklahoma. Grimm, E.C. 1984. Fire and other factors controlling the Big Woods vegetation of Minnesota in the mid-nineteenth century. Ecological Monographs 54:291-311. Hoagland, B. 2000. The vegetation of Oklahoma: a classification for landscape mapping and conser­vation planning. Southwestern Naturalist 45:385-420. Johnson, K.S., C.C. Branson, N.E. Curtis Jr., W.E. Ham, W.E. Harrison, M.V. Marcher, and J.F. Roberts. 1979. Geology and Earth Resources of Oklahoma. An Atlas of Maps and Cross Sections. Oklahoma Geo­logical Survey Education Publication Number 1. Norman, Oklahoma. Lewis, A. 1924. LaHarpe’s first expedition in Oklaho­ma, 1718-1719. Chronicles of Oklahoma 2:331-349. Masters, R.E., J.E. Skeen, and J. Whitehead. 1995. Preliminary fire history of McCurtain County Wil­derness Area and implications for red-cockaded woodpecker management. pp. 290-302. In D.L. Kulhavy, R.G. Hooper, and R. Costa, editors. Red-cockaded woodpecker: Species Recovery, Ecology and Management. Center for Applied Studies, Stephen F. Austin University, Nacogdoches, Texas. Nuttall, T. (S. Lottinville, editor). 1980. A Journal of Travels into the Arkansas Territory During the Year 1819. University of Oklahoma Press, Norman, Oklahoma. Oklahoma Climatological Survey. 1997. Climate of Oklahoma. Statewide Precipitation and Tem­perature Maps. Oklahoma Climatological Survey, College of Geosciences, University of Oklahoma, Norman, Oklahoma. <http://www.ocs.ou.edu>. Steuter, A.A. 1986. Fire behavior and standing crop characteristics on repeated seasonal burns – north­ern mixed prairie. pp. 54-59. IN A.L. Koonce, editor. Prescribed Burning in the Midwest: State-of-the-Art. Proceedings of a Symposium, University of Wisconsin at Stevens Point. Truett, J.C., M. Phillips, K. Kunkel, and R. Miller. 2001. Managing bison to restore biodiversity. Great Plains Research 11:123-144. Wyckoff, D.G. and L.R. Fisher. 1985. Preliminary testing and evaluation of the Grobin Davis archeological site, 34Mc-253, McCurtain County, OK. Archaeological Resource Survey Report 22. Oklahoma Archeological Survey, Norman, Oklahoma.